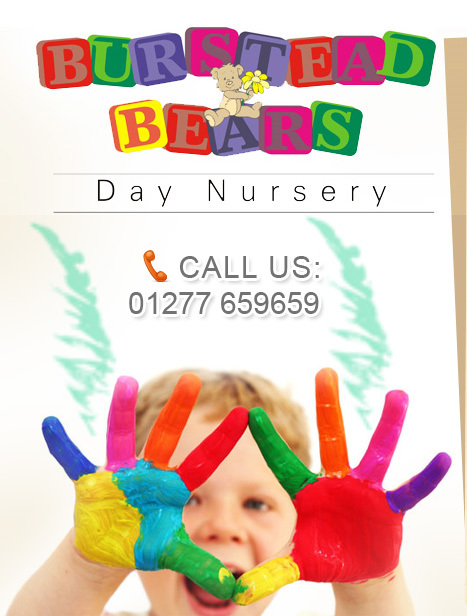 At Burstead Bears Day Nursery we believe that our children deserve the right to receive the best individual attention, a guarantee to care and an education of the highest degree. We provide a high ratio of quality early years childcare staff specialists and our extremely skilled staff are fully trained with recognised qualifications in child care. Additionally, all staff and volunteers undergo an enhanced Criminal Records Bureau check. All of this combined makes us what we believe one of the best nurseries in Essex. We are proud of our staff retention rate and put this down to careful selection and dedicated training programmes. We also provide a fun and happy environment which benefits the children and the staff who work for us. When a child begins at Nursery they are allocated to a key person. This key person will have the special responsibility of building strong relationships with the children in their small group and will be the point of contact to parents who wish to discuss their child's development. Andrew is the founder of Burstead Bears Day Nursery and is fully committed to supporting the nursery's CEO/Manager Rachael Robinson. Andrew also looks after the financial aspects of the Nursery. Rachael being a founder member of Burstead Bears, helped start the nursery back in 2006 and is the Chief Executive Officer (CEO) and Manager. Thanks to Rachael's love and passion for Burstead Bears, her continious pursuance of excellence has been rewarded by the setting being recognised as an award winning, Ofsted Outstanding nursery since 2010. We have also been repeatedly been voted by an independent body as a top 10 nursery in the East of England, ahead of 930 other nurseries. Due to Rachael and her team's achievements the nursery has built an enviable reputation that we continue to enjoy today. Rachael has a wealth of experience in childcare having qualifications in both childcare and management; she also has the overall control of the day to day running of the nursery. Paula qualified as a nursery practitioner in 2006. Since this time Paula has progressed to be a most professional and skilled practitioner, who has achieve the equivalent to an NVQ Level 4. Due to Paula's vast experience, she has earned the respect of all her colleagues, which is due to her capacity to comprehend and respond to our children's needs with ease, she is also perceptive, supportive and patient with both children and colleagues alike. Nicola started life at Burstead Bears working in our baby room, she has now progressed to successfully running one of our toddler rooms. Nicola is a bright, enthusiastic and caring individual who speaks French, which she puts to good use by introducing the language to our children. Nicola is a naturally gifted nursery practitioner who has a passion for working with young children. Due to her friendly warm-hearted manner Nicola has the ability to interact and bond with all children with the greatest of ease. Abi started at Burstead Bears in 2010 as a trainee and worked her way up the ladder to become a qualified nursery practitioner. In October 2011 Abi took time out to give birth to a beautiful baby boy, after which we were delighted that Abi returned to the nursery to continue her good work as valued member of our team. Keli has been working in the childcare sector since 1998, during which she has worked as a nanny for 10 years with children aged up to Shannie16, and as a nursery practitioner with children from birth to age 5. Within Keli's role she has cared for many children of varying abilities including a 5 year period where she had great pleasure in caring for child with autism, who thanks to Keli's input is today learning, socialising, communicating developing really well. This makes Keli one of the nursery's most experienced and respected members of staff. After all the years Keli has worked in this sector, she still maintains the same passion in her role caring for children and helping them progress as she did when she first started. Keli's main pursuit outside of work is caring for her 3 horses as well as competing in various equestrian events, in which she has been most successful winning trophies for show jumping, cross country and dressage. Bethany is a bright, cheerful and outgoing character, who joined our nursery team because after completing a 2 week work experience at a nursery, she realised that it was a long term career in childcare that she wanted to pursue. Bethany enjoys creative art and in particular painting, which is put to good use with the children. Since becoming a member of Burstead Bears, Bethany has demonstrated excellent interaction skills, as well as a willingness to help others and a desire progress in her role within the nursery to make a rounded member of the team. Nicole is a happy, gentle and caring person with whom children immediately identify with. Nicole studied animal care for one year at college, but soon realised that her true passion was working with children and it was this career path she chose. Nicole participates in performing arts and has performed at the Thameside Theatre, she also enjoys playing the guitar, various outdoor activities and caring for animals. Like other members of staff, Nicole puts her performing arts and musicality skills to good use at the nursery by encouraging the children to participate in various related activities, which the children have great fun with. Chloe has a calming, nurturing persona that is demonstrated by the love, care and attention she provides to the nursery’s children. Like so many other nursery practitioners, Chloe first decided that she wanted to work with children after completing her school work experience with a local nursery. Since then Chloe went on to college where she attained her level 3 qualification in childcare and subsequently joined Burstead Bears. Chloe is a motivated and ambitious person who not only is looking for a long successful career in childcare, but in the longer term is hoping to own her nursery. Outside of work Chloe is a qualified lifeguard and enjoys swimming, going to the cinema and spending time with friends. Shannon is a quiet, gentle and caring person which makes her perfect for working with ourearly years children. When Shannon went to college she studied health and social care for two years, but soon recognised that her true desire was to work with children, hence joining Burstead Bears. Shannon’s first taste of caring for children was when she used to babysit for her very large extended family, where she took particular enjoyment seeing the children learn and progress in the different areas of their development. During Shannon’s studies she excelled in Maths, English & Science. Shannon enjoys in her free time to socialise with her friends and family, going to the cinema and shopping. Fiona is the 2014 and 2015 Irish dance champion for Southern England and competes in the Irish dance world championships each year. In Fiona’s spare time she enjoys teaching 3 & 4 year old children Irish dance and loves to see the children progress in their dance abilities that takes them to competitions, which in turn has helps build their confidence. It was seeing the children’s progression that inspired Fiona to want to work with them full time and see how they progress in all other areas of their development. Fiona has a very positive outlook, she is motivated, imaginative, caring and fun, she also loves interacting with people of all ages and all walks of life. Whilst studying Fiona excelled in art & craft and achieved an AA in Business Studies. It goes without saying that the nursery puts Fiona’s amazing achievements to good use with the children who benefit hugely by her talent. Jodie was initially inspired to work in childcare by her mother who had worked in the childcare sector for many years. Since joining Burstead Bears Jodie has displayed her passion of working with children by showing a great deal of empathy, warmth, understanding and enthusiasm whilst interacting in both play and education. This is evident as the children immediately warm to Jodie’s friendly and gentle persona. Jodie’s interests include: canoeing, sailing, reading and painting. Summer is a very gentle, kind and caring person, who is easy to liaise with. Summer was initially inspired to work in childcare from when she used to help babysit for her family members and enjoyed the interaction she had with the children. Whilst Summer was at school she completed a 2 week work experience at a local nursery, which she absolutely loved, and it was this that made her realize that working with children was the career path she wanted to follow. Due to Summer’s lovely nature she conveys a calming influence to our children. Summer is very creative and excels in fine and imaginative art, which the nursery’s children benefit by. Her other interests include dog walking, music and dance, ice skating, also spending time with family and friends. Kimberley is an energetic, fun and creative member of our team. She was instantly drawn to childcare as a career path as she was the eldest sibling of four children and immediately felt like a mother figure and enjoyed helping them in all aspects of their lives.When Kimberley had the opportunity to complete her work experience in a primary school, she realised that this would the career path that she wanted to follow until such time that she joined Burstead Bears. Kimberley’s long termgoal is to attain a degree in early years and go on to become a qualified teacher.Kimberley enjoys many outdoor activities and introduces some of these activities to the nursery’s children. Colette largely contributes to the success of our kitchen, helping maintain our prestigious Gold Award for Healthy Eating, also the 5 Star Award for Food Hygiene. Both of these accolades have only been achieved by a handful of nurseries in Essex. Through Colette's efforts the children enjoy healthy and nutritious meals with a fantastic variety of food. At the request of our parent's, we have produced our own recipe booklet that is available at the nursery. The information contained in this website is for general information purposes only. The information is provided by Burstead Bears Day Nursery Limited that provides services like nurseries, childcare, day nurseries, Pre school or Pre schools in Billericay, Basildon, wickford, Shenfield, Hutton, Brentwood, Essex and while we endeavour to keep the information up to date and correct, we make no representations or warranties of any kind, express or implied, about the completeness, accuracy, reliability, suitability or availability with respect to the website or the information, products, services, or related graphics contained on the website for any purpose. Any reliance placed on such information is therefore strictly at the visitors own risk.